Just check out that happy smile! 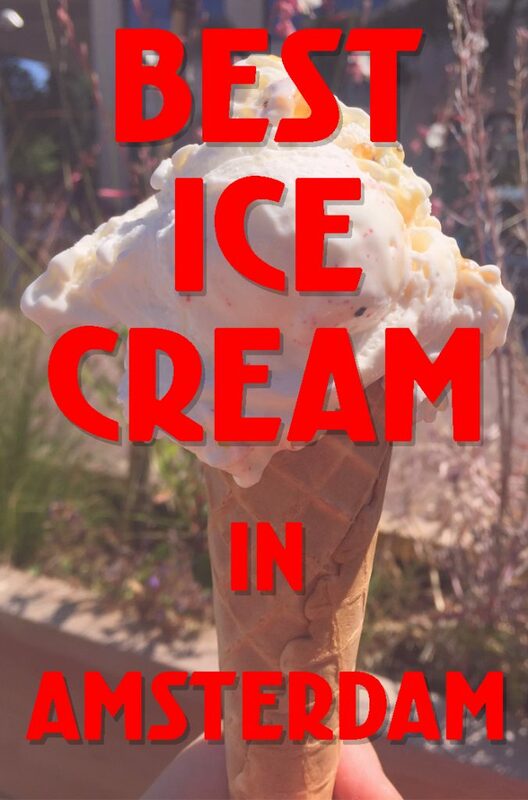 Maybe you’ve heard the phrase “I scream, you scream, we all scream for ICE CREAM”? 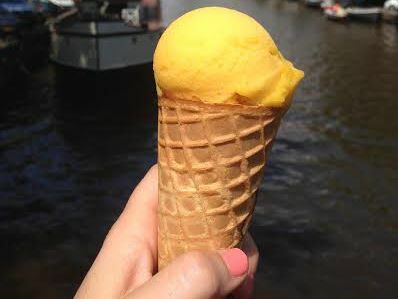 Here in the Netherlands it’s called IJs or IJsje (pronounced somewhat like ‘ice’) and we scream for it just as loudly! 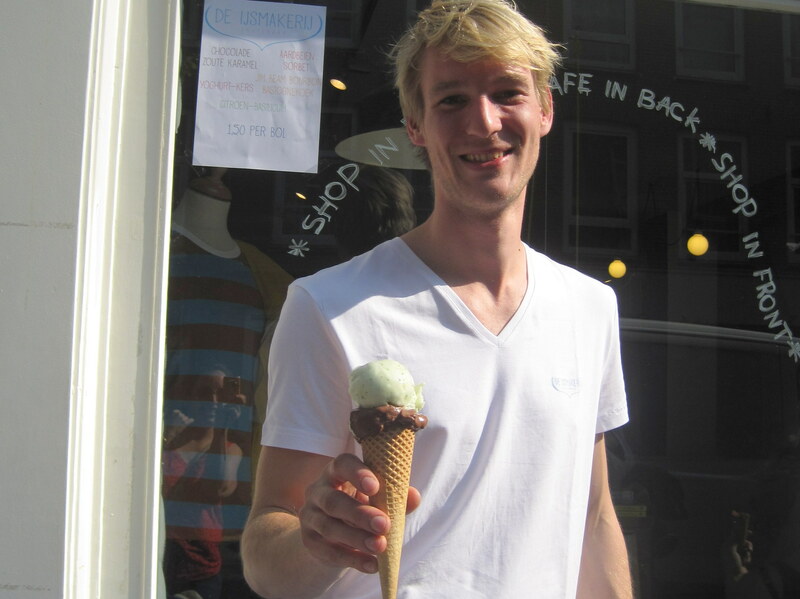 Here are a few of our favorite ice cream shops in Amsterdam. You simply must try this creamy Dutch ice cream in unique flavors like Bitterkoekjes and Speculaas. My favorite is the Yoghurt-kers, a slightly sour plain flavor with streaks of cherry jam. Yum! IJscuypje is open from Spring through Fall, then it turns into Stamppotje for the winter, serving the traditional Dutch mashed potato dish in several flavors. Quite the opposite of ice cream and just what you need to warm you up in the cold, wet winter. IJscuypje has more than 10 locations in Amsterdam and it seems more are popping up all the time. Joepie! The charming streets of the Jordaan are the perfect place to stroll while lazily licking an ice cream cone. 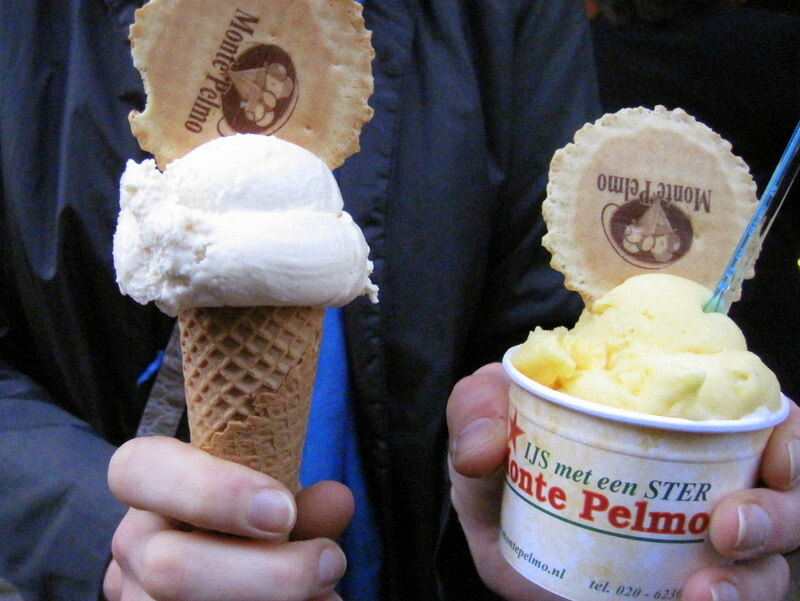 And Monte Pelmo is the perfect place in the Jordaan to get amazing gelato! With many delicious flavors to choose from, Monte Pelmo nearly always has a queue in front, but it moves quickly. I love their passionfruit sorbet, but am always fascinated by the bright blue ‘Smurf’ flavor. Does it taste like a smurf? What do smurfs taste like? Possibly I will never know because I can’t order anything but the passionfruit, it’s so yummy. A recipe for the perfect evening includes pizza at La Perla and a stroll around the Jordaan with a Monte Pelmo gelato in hand. Be sure to wear your loosest jeans. People go crazy for this simple ice cream that only comes in one flavor. 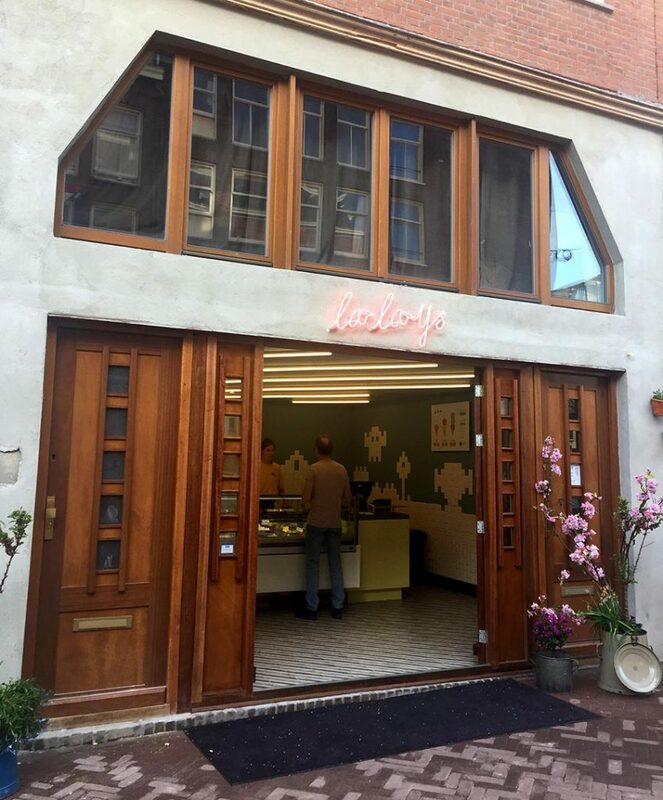 This shop on the Nieuwendijk shopping street serves creamy, soft vanilla ice cream. 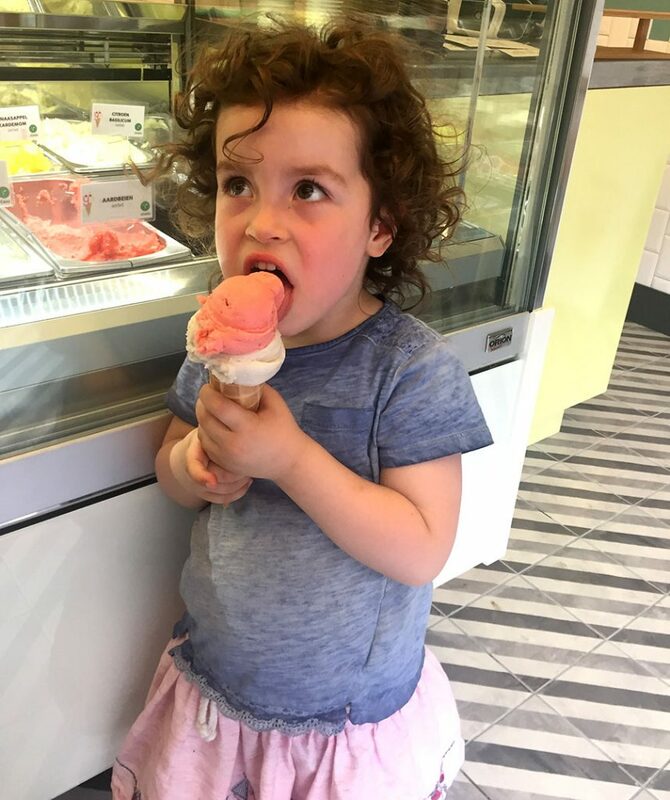 There is nearly always a line out the door of the small shop, and happy customers can be seen in the street licking big dripping cones of the pure white delight. Fans of HEMA or McD’s soft ice cream should be sure to stop by and see what the real stuff tastes like. 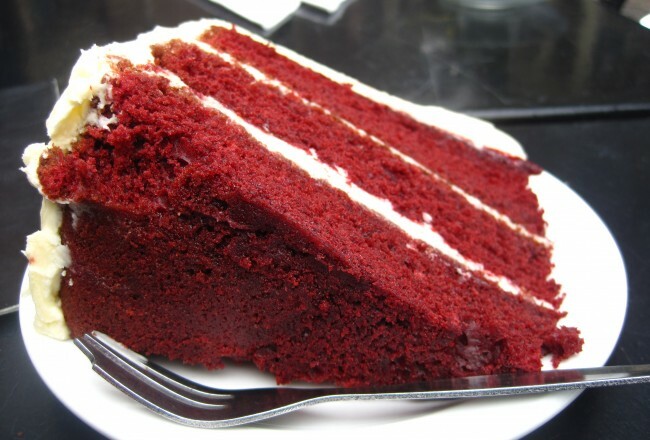 We’ve heard it described as “heavenly”, “the best in the world”, and “like eating fresh whipped cream, but cold”. Next time you’re shopping at C&A, H&M or V&D, try it for yourself! 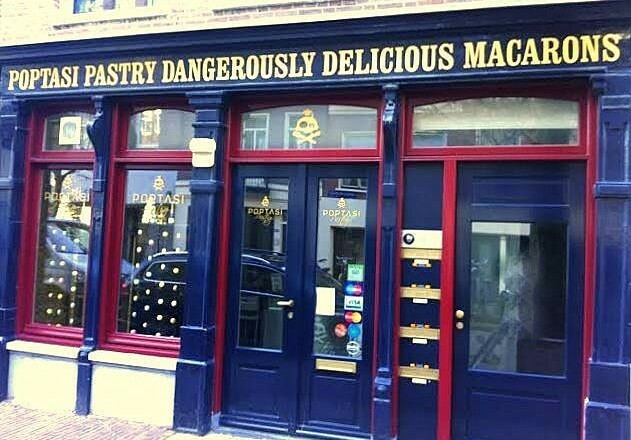 Although Amsterdam is full of delicious ice cream, we’d have to say the very best we have tasted is made by de IJsmakerij. Started by young entrepreneur Michel Smit, de IJsmakerij hand makes fruity sorbets and rich gelato in Amsterdam West using organic milk from a nearby farm in Noord, delivered by bakfiets. The creative flavors like salty caramel chocolate, 3 pepper and lemon-basil sorbet are amazingly delicious. You can find the lovely creations of de IJsmakerij at Noordermarkt on Saturdays, or sample the ice cream at cafes around town and La La Ijs, mentioned above. Buy a pint to go at stores like Sterk. If you see Michel, tell him I say hello! 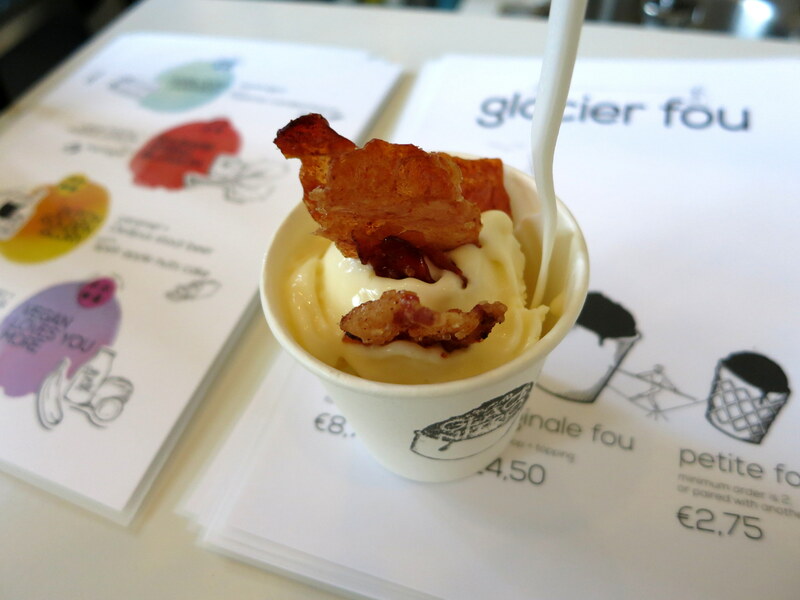 An ice cream shop has popped up in Oost at the Beukenplein, and everyone is flocking there to taste their fresh flavors. We love the name alone, IJsboefje could be roughly translated as “the little ice cream brat”. Love! Before or after your tasty ice cream, stop by one of the other business around the Beukenplein including Coffee Bru, Smokin’ Barrels and just around the corner Bar Bukowski. Are you a fan of creative ice cream flavors? Or maybe you’re vegan or you can’t eat lactose but you crave ice cream and gelato on a warm summer day. Either way, every ice cream fan should sample Professor Grunschnabel’s dairy-free creations. With delicious flavor options like Café et Khatib (coffee with cardamom and vanilla), Indian Winter (a spicy Chai-like flavor), and Siam Horapa Coco (Thai basil and coconut) each taste of Professor Grunschnabel is like an exotic party in your mouth. You can find Professor Grunschnabel at festivals and weekend markets around Amsterdam like the Local Goods Weekend Market and De Parade and at many stores and restaurants including Vegabond, Sterk and Amsterdam Roest. 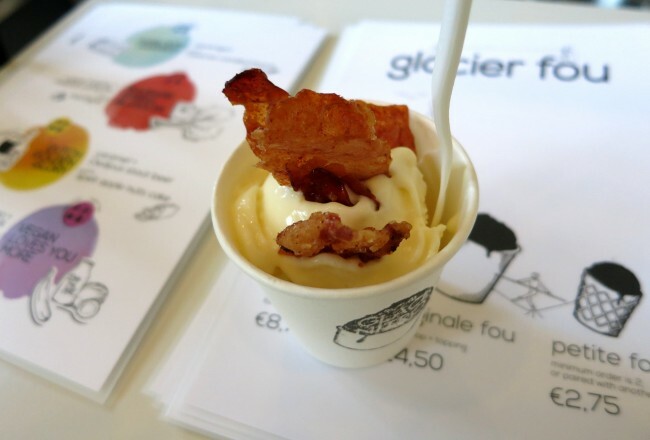 If you’ve never tried goat milk ice cream it might sound strange, but the delicious biological ice cream from the goat farm in Amsterdamse Bos will win you over. A visit to the goat farm is a ton of fun. Lots of cute baby goats hop and frolic in the fields and pens. In addition to ice cream you can buy homemade goat cheese, organic and biodynamic eggs, goat milk, goat milk yogurt, and even goat (and other types of) meat. And on Saturdays there is a small organic farmers market. A chocolate lover’s heaven, stop in to Metropolitan in the heart of the city for homemade ice creams made with organic milk from the Ons Verlangen dairy farm in Noord. Six varieties of chocolate ice cream as well as flavors like vanilla, lemoncake and mandarin await you. But wait, there’s something different too! You simply must sample their beer sorbets made with Two Chefs Brewing beers. They are surprisingly delicious. And if you prefer a G&T to a beer? Metropolitan has you covered with several amazing gin and tonic sorbet flavors. A must try for cocktail lovers! A shop full of chocolates serving yummy gelato too? Yes, my dreams have come true! This is the place to stop by on the Haarlemmerdijk to get a box of chocolate bonbons for your sweetie and a gelato for you! Do you love ice pops, ice lollies or popsicles – whatever they might be called in your local language these yummy cold treats on a stick are always fun and delicious. Head to IJsmanschap for a wide selection of handmade ice pops in unique flavors. A relative newcomer on the IJs scene, DutchHomemade has fresh homemade ice creams with creative flavors like pepper, as well as favorites like chocolate cookies and mango sorbet. Also try out the addictive bonbons. Started by a group of Italians in 1935, Pisa IJs certainly has some of the best gelato in Amsterdam. With a small stand by the Amsterdam RAI, everyone can get their gelato fix and more! Fun banana splits with rainbow sprinkles and ice cream cones with cute bear faces – this is a great ice cream shop to come to with the kids! And if you’re not in the mood for ice cream, go for the fries! Now my brain is screaming for ice cream, isn’t yours? 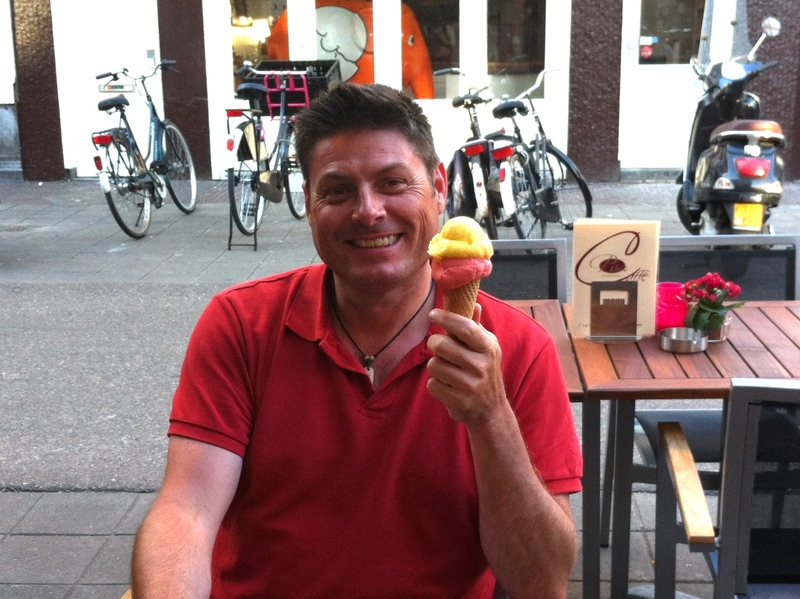 Is there an Amsterdam ice cream shop that you love? Please let us know about it! Connect with us on social media.